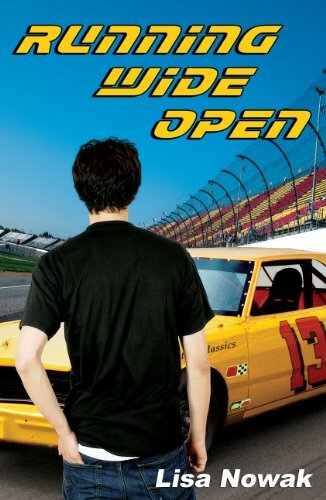 Cody Everett has a temper as hot as the flashpoint of racing fuel, and it’s landed him at his uncle’s trailer, a last-chance home before military school. But how can he take the guy seriously when he calls himself Race, eats Twinkies for breakfast, and pals around with rednecks who drive in circles every Saturday night? What Cody doesn’t expect is for the arrangement to work. Or for Race to become the friend and mentor he’s been looking for all his life. But just as Cody begins to settle in and get a handle on his supercharged temper, a crisis sends his life spinning out of control. Everything he’s come to care about is threatened, and he has to choose between falling back on his old, familiar anger or stepping up to prove his loyalty to the only person he’s ever dared to trust. I’m not much of a fan of racing; I like bikes and cars, and the feeling speed gives, but I’m not much for racing. I think that’s the main reason why this isn’t a 5 butterflies, a lot of the time we were focusing on this thing that isn’t that interesting for me. Now, that being said, this was one awesome book. For starters, I loved the fact it has a male MC, namely Cody. He’s a disoriented, sort of bitter young man, with less then stellar family history and some behavior issues (minor compared to how bad they could have been, all things considered), he’s fun, he has awesome T-shirts that I just love him for, a great sense of humor and he interacts with people around him in the funniest way, especially with his uncle, that I adored, Race. As a character, Cody is all that he could be and then some, and as a person, he’s sort of awesome. His uncle is even more awesome, and the both of them make for a lot of great reading. I wouldn’t say I liked the female characters in the book that much, not even Kasey. And I would have loved to strangle Cody’s mom, but in that I wasn’t alone, basically everyone that mattered wanted that too, so it’s a very popular club. As far as the plot goes, this is a bildungsroman, rich with all the elements that you’d expect; conflict, tension, hurt feelings, gaping wounds, and love. A lot of the action revolved around racing, as I’ve said before, Cody’s uncle Race being a racer and all. It was fun, and entertaining, but I wouldn’t go as far as saying I was riveted. That’s for the first half or so of the book. Then came the second half, and it blew me away. For various reasons that I obviously won’t blab about and spoil your read, the second part of the book was a shocker, and sort of demanding, almost emotionally draining at some point. It was the real-growing-up part of the book, really, and it was done beautifully. The second part of the book is the reason this is a 4 butterflies and not a 3 butterflies read. The writing is really good, it’s fun and light overall, and it glides well through the tense, emotionally charged parts. The characters have their own voices, and they’re strong voices, something I always enjoy fully in a book. It makes them realistic, charming, and a pleasure to read about, it’s a great crowd to be in for as long as it lasts. I say read this book, it’s fun, it’s beautiful, it’s about racing a lot (now that’s not something I get the chance to say that often), it’s a very cool read that will give you a feel-good state of mind. Awesome read.